Between interning in D.C. with the Discovery Channel, working at the Lancaster CSA I farmed with last summer, teaching yoga, and some other odd jobs, I’ve been having one crazy, busy summer. Cooking has actually been pushed somewhat to the back burner. (Hence the numerous salads I’ve been whipping up lately.) But don’t worry, getting creative in the kitchen will always be a part of my life, busy or not. With nearly every bit of free time I do have, I’m still at it, slicing, dicing, spicing, and enticing. The food-filled art form is one of my favorite ways to spend my downtime in the evenings. It’s even better in the accompaniment of good friends and conversation, and when I can enjoy the results outside, amidst those warm summer sunsets. This past weekend, I found some time to do just that with a few friends after work. I decided on making tacos, a dish I generally always find to be a safe bet, especially when you have some skeptical meat-eaters in the mix. However, I quickly strayed from the Mexican-styled vegetarian tacos I usually make. I came home from my CSA job with a bag full of snow peas, my first of the season, and was eager to put them to use right away. So somehow I settled on throwing them in with the taco idea. It wasn’t necessarily a playing-it-safe kind of move, but it turned out to be a winner among my friends. My classic refried bean filling went abandoned for a much lighter and more summery taco creation. I sauteed the crispy snow peas with some chewy mushrooms, and placed the duo with an easy pairing of straight up, soft black beans. And best of all, I topped it all off with a fresh mango salsa. The sweet and cilantro-y island take on salsa never fails to shine through. This was a real treat, and combined so many flavors of the season. If you can’t find the garlic scapes used in this recipe, simply swap them out with a couple cloves of garlic. Garlic scapes are currently a hot item at most farmer’s markets right now, but they won’t last long. They have an appearance similar to ramps, but are actually the stems that grow off of the stalks of garlic. The scapes have a slightly less pungent, but still notably unique garlicky taste, which is why garlic cloves are a suitable substitute if you can’t find them. Heat olive oil over medium-high. Add onions, ginger, and garlic scapes. Saute until onions for 4 minutes. Add mushrooms, and cook until mushrooms are nearly tender. Mix cornstarch with 1 Tbsp. of water. Stir in sherry, soy sauce, cornstarch, and salt, to taste. Add snow peas, and saute 3-4 minutes, until tender but still slightly crispy. Remove from heat. 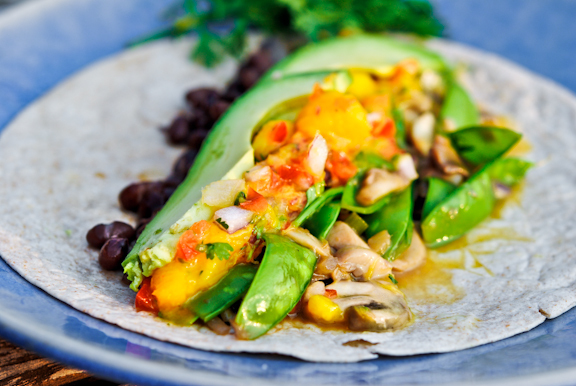 Top each taco shell with mushroom-snow pea mixture, black beans, avocado and Mango Salsa. For the Mango Salsa: In a medium bowl, mix all ingredients together. Let ingredients macerate together for at least 15 minutes. oh I’m loving this idea for tacos! Everything, I ove everything about this. The taco ingredients, the mango salsa, the pictures. Incredible. GREAT recipe! Thanks so much for sharing. I can’t eat mango on my IBS diet, but I love recipes like this to make for parties. 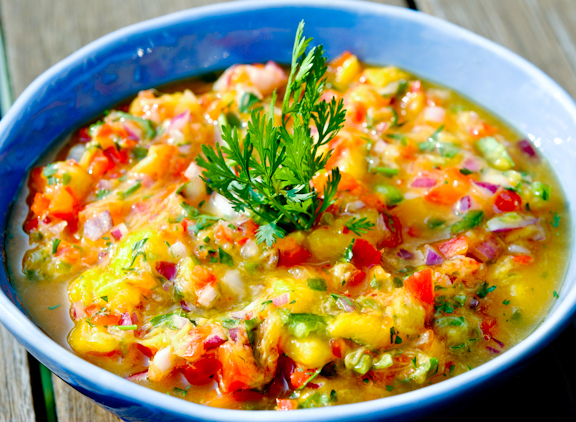 That mango salsa sounds perfect for the mangoes I got on sale this week…yummmm! Snow peas and sugar snaps are my absolute favorite farmer’s market find right now! They are so unbelievably sweet…almost like candy! I am LOVING these tacos…especially because i have garlic scapes in my fridge waiting to be used! Mushroom tacos sound fantastic- I’ve only tried making pretty standard plain bean versions so far, but this is definitely a step ahead! “Between interning in D.C. with the Discovery Channel, working at the Lancaster CSA I farmed with last summer, teaching yoga, and some other odd jobs”…. um want to switch lives!? Love mushroom tacos and totally adore your twist with the mango salsa. Yum.